My BHJ funded trip to Belize had two major goals: (1) to see for myself the field work which the Global Mental Health Fellows (Mount Sinai School of Medicine psychiatry residents who apply to work in Belize) are doing as part of this Fellowship which I direct in collaboration with Belize Ministry of Health; and (2) to conduct some of this work myself. Both of these goals were accomplished to my greatest possible satisfaction. In the course of my week in Belize, I had the opportunity to visit a number of clinical sites across central and western Belize. 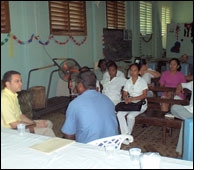 These included the Belize Central Prison, the only prison in Belize which several years ago was sub-contracted to a non-profit organization in order to improve the conditions there; the Karl Heushner Memorial Hospital, the main general hospital in Belize City; Rockview Psychiatric Hospital, the only psychiatric hospital in Belize; and several regional mental health clinics, one in Belmopan and two in Belize City. Along with my resident, this allowed me to see patients served by the public mental health system and to meet with staff and offer them some of my relative expertise in psychiatry. The public mental health system in Belize has only 2 psychiatrists and is largely staffed by nurse practitioners and lay staff who lack specialized training in psychiatry. Our visit provided them with an opportunity to learn and to improve the care they provide to their patients. I therefore saw challenging patients, conducted supervision, and lectured on topics of interest to the staff. I am amazed by how thirsty they are for knowledge and how grateful they were for what we could provide them. If a lecture was set up for 4 of the mental health staff, word would somehow get around and over 20 professionals of all kinds from the hospital and even the community would show up. This trip also afforded me the opportunity to meet with a number of local leaders in the public health/mental health system, including the chief psychiatrist for Belize (and my main collaborator when I am back home), the senior physician in the health services, and the head of the prison. This has made it possible to review the success of our 2 year old collaboration to date and to make concrete plans for the future. Belize seems like an ideal place to export our psychiatry resources, both due to the openness of the Ministry of the Health to our involvement and even due to the fact that English is the primary language of the country. I am now confident that our program here will flourish and hopefully grow to include more residents, faculty, and even medical students.